Compact and efficient, the Canon IR-500i multifunction printer improves your workgroup's productivity as it combines four office machines in one. The device prints, scans, copies, and sends out fax messages. It even offers advanced features that make document handling more convenient. With its space-saving design, the Canon IR-500i all in one is the perfect choice for busy office environments with a limited workspace. It offers faster print speeds and convenient user configurations, but lacks colour production, making it more suitable for document handling and production. 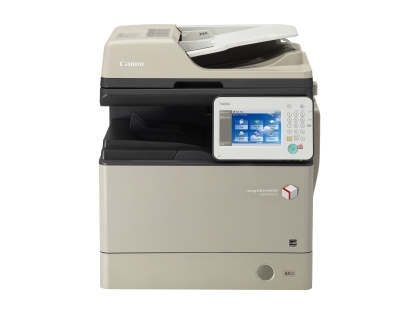 The Canon IR-500i offers a compact design, ideal for limited workspaces. A large, touch screen LCD panel sits on the right-hand side and allows easy navigation through the menu options. The IR500i comes as standard with a finisher unit, which adds a little to the bulk of the machine but offers functionality not found on some competing machines. The device has a maximum input capacity of up to 2300 pages, which makes it the best choice for busy print environments. It is equipped with a built-in duplexer and automatic document feeder, which makes paper handling easier. Multi-functionality is the best selling point of the Canon IR-500i all in one. However, it offers many other features that set it apart from other multifunction units. It uses monochrome laser beam printing technology, which allows high print resolutions up to 1200x1200 dpi. It comes standard with a duplexer, ADF, and finisher unit, and it supports a wide variety of media for flexible printing. The built-in fax modem transmit at a rate of 33.6 kbps, and it features fax capabilities such as speed dialling and sequential broadcasting. One downside of the Canon IR-500i is its inability to produce colour, as the unit is only designed for monochrome printing. As a result the IR500i would likely be purchased along with another printer for printing in colour.